There is definitely something fishy about this month’s First Friday Giveaway! The adorable plush and slightly plump fish pictured here caught my eye (yes, that pun was intended!) because of its color and gigantic smile. I then learned that my new finned friend was the main character in The Fish with the Deep-Sea Smile, a story written by Margaret Wise Brown. This of course made him super-duper special. Clementine, the temporary name I’ve given Fish, is sure to be a great book buddy and could also be the focus of a fun-filled character study. 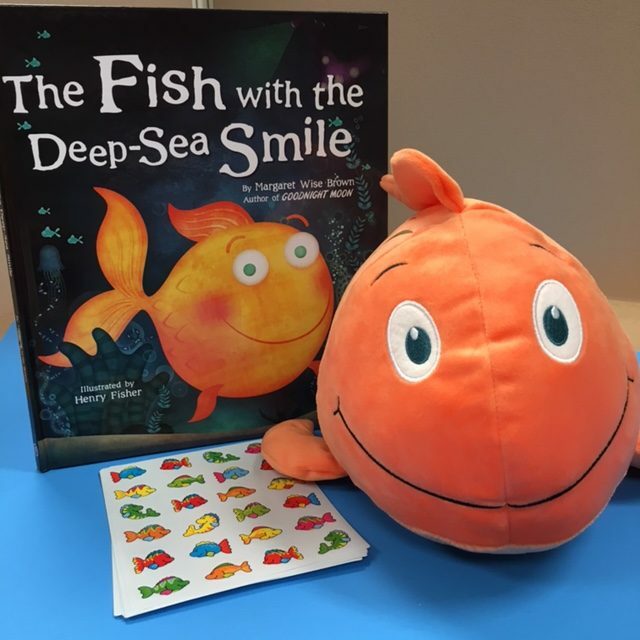 If you’d like to enter for a chance to welcome Clementine into your classroom (along with a copy of his book and a pack of 144 colorful fish stickers) leave your answer to the following question right here on the blog before midnight, March 11, 2018. Good luck! Clementine is a real cutie! PS: Hooked on prizes? Swim on over to Karen’s blog, she has some goodies to give away too…. Congratulations to Monica, the winner of this month’s First Friday Giveaway! Spring break is week after Easter including Good Friday. No Spring break here. We had an extra break in November. Right now we have Good Friday and Monday off. We just have Good Friday off! Spring break is March 12-16. March 12th – 16th! Woohoo! I’m a children’s librarian. We don’t get a spring break. The main library is closed on Easter Sunday.???????????????????????????? We have spring break the week after Easter! I can’t wait! Not soon enough! Ours is March 12th-16th. March 26-30. First time we have had a week for spring break ever. Our’s is March 12-16! Our students are looking forward to some free time reading! Mine starts at 3:00 today!!!! Our Spring Break is the week of March 12. Spring Break for Hawaii’s public schools is March 18-25, then schools are off on Monday the 26th for Prince Jonah Kuhio Kalanianaole Day, a State holiday, and on the 30th, Good Friday. However public libraries are open during Spring Break so we’ll be welcoming families who come to borrow books and more, and attend programs. Our Spring Break begins March 23rd and we return to school April 2nd. So, my Spring Break begins at 2:52 p.m. on March 22nd, but realistically, I won’t get o0ut of my classroom by then! We only get Good Friday and Monday off. Spring break begins on Good Friday and continues the week after Easter. My spring break is the last week in March ???????? March 16-23-we get a week and a day! Good Friday and the whole followong week. Good Friday through the Friday of the following week. Happy Spring! Our Easter Break is Good Friday and the week after Easter. My son’s Spring Break is the week before Easter. The first full week of April ???? We only get Good Friday and the Monday after Easter. No week long Spring break for this WV Mountain Teacher. We home school and haven’t decided yet. We generally take Fridays off so they’ll definitely have that time to hang out. We may do something more calm like videos and lots of extra reading (instead of workbooks and intensive studies) and themed worksheets/coloring instead of having a full break. There’s always a chance we may need to do something later in the spring, though, so we could take time then! This book would be great for when we circle around to studying ocean animals this summer! Spring break is from March 12-16! Can’t wait!! Spring break is March 8-11th! Wow! Looking at these comments, lots of people have spring break a lot earlier than we do. Our spring break is April 23 – 27. Our spring break is cut short because our governor decided that schools will start after Labor Day this year and end before June 15th. So, instead of having a week and a day for Spring Break, we only have Friday March 3rd – April 2nd. Very different for us!! We get out early the Wed before Easter and come back the Tuesday after! Looking forward to it! Spring break is April 9th – 13th. The fish is super cute!!! I don’t get spring break because I work in an Early Headstart Program and we are year round. I do have a few days off as a vacation and go back to work on Wednesday. Last week of March ???? Our spring break is the last week of March. I can’t wait!!! My “Spring Break” as a family childcare provider begins March 9-18. Heading to TN to see grandbabies. Good Friday and the week after Easter. We do not have a Spring Break. We do get Good Friday off, but not for Spring Break. Many schools around us have the week before Easter off. No spring break for me. I own a childcare. A wonderful Spring Break for Teachers, children and Parents! I teach at a year round school somour spring break is a little different. We have off from march March24-April 19. We don’t really get a spring break at my preschool but some of the families are taking off next week since my center is affiliated with a university. Unfortunately the Air Force never gets a spring break! Our Spring Break is March 30th-April 6th. Good Friday and the Monday after Easter. Last week in March! So close yet so far ???? Starts on Good Friday and goes through the first week of April. Counting down till March 26-30! March 26- April 3!! Can’t wait to spend the time with my baby girls!! The first week of April! It’s coming fast! ???? March 28th through April 2nd. The week after Easter. Beginning with Good Friday. Our Spring Break is March 19-23!!! i am a preschool teacher so i don’t really have a spring break. March 26-30…plus taking a day off, April 2, for my birthday! Just finishing winter break, also have a spring break last week in April. We don’t have a spring break at my school. We get the Friday off before and the Monday off after Easter. Makes for a long time without a break from January till April! Good Friday and the first week of April. Our break is Good Friday and then the week following. Last full week of March!! Woo hoo! Our preschool doesn’t take spring break. Hawaii’s spring break is March 19th-23rd. Our Spring break starts on Good Friday, March 30th, and ends April 6th. Last week in March. Go back to school on my birthday! My Spring break is April 9-13. Our Spring break includes Holy Thursday, Good Friday and the week of Easter! First week of April, best time for it!!! The last week in March! ???? Our Spring break is the first week of April. April 9-13. Is it wrong to say that I can’t wait? ???? Spring break starts April 21st-29th. My spring break is Good Friday and the week after Easter. We do not have a spring break. We have Easter vacation. March 28, 29, 30, & April 2. March 12-16. One more week! We have off March 28-April 2nd but since my class only meets Tuesday through Thursday, I guess I only have March 28 and 29. Our break is March 12-16. Pre k teachers do not get spring break ..we work all year long ! April 2-6. This is ADORABLE! We have Thurs, Fri, before and Mon after Easter. We have Good Friday off! That’s it! Our Spring Break is March 26th-30th. March 26- April 2! The last 8 weeks of preschool will fly by then! Will miss my group! Our spring break is March 29th – April 6th, 2018. We get 4 days off at Easter. I homeschool, so basically when ever I choose?! The first week in April. Spring Break is the last week of March! Later than usual, starting March 19th! LAUSD is off the last week of March! I work in a center open all year around, so we don’t get a spring break 😉 But we are closed for a half day on Good Friday! Good Friday through the first week of April. Spring Break is March 26th-30th. We return the day after Easter or April Fool’s! Ours starts at 11:30am on March 29th until we return on April 9th! Mine starts at 3pm on March 28-April 9. Can’t wait!! The week of March 12th. Last week in March. Can’t wait! March 26 through April 2nd. March 16th can’t come soon enough. Cape Cod here I come!! We have Good Friday and the following Monday off. Our spring break starts Friday March 16th and we go back Monday March 25th. It’s sad that Spring Break begins on March 31st and we will be hanging around the house as we have a new driver, needed to find a third car and he is also in the band so he went to Disney World to study with Disney Musicians. Oh the places he will go. Spring break is the first week of April. I really need some sun. Spring Break here is March 12-16. We dismiss at 1:00 on Thursday, March 29 and go back on Tuesday April 3rd for Easter/spring break. Our spring break is the week of April 23rd. We just had our February break and another snow day today. WOW I get so much done in a 4 day school week! Spring break will be within two weeks. Our spring break is March 19th thru the 23rd. Love Clementine!! Super cute! We are on the last day of school before Spring Break. We have off March 10th through March 18th. Just started Spring Break!! Whoo Hoo!! I have 5 Prek children who will be on Spring break March 19, I also have 12 wrap around children. No Spring break for them or me. Spring break starts March 17th. We have the Thursday and Friday before Easter off. The week after Easter starting with Good Friday is my spring reak. Our District’s Spring Break starts Friday, March 30 and we head back Monday, April 9. ???? This next week! Started on the 10th of March! Week before Easter but I wish it were the week after???? My spring break is April 16-20. If we get one more snow day vacation will be shorter! March 19-23. One more week! It is the first week of April. Our Spring Break begins in Plant City, Fl on March 12????????????. Wishing our weather would be a little warmer but we’ll take it! Being in a child care center, we don’t get a Spring Break! This past week March 5-9th! My Spring Break is March 12-16. I work in a child care. We have a training day on Good Friday and do not get a spring break! Week after Easter and Good Friday. Our Spring break is last week in March! The last week of March!! Our spring break is the last week of March. Looking forward to Spring cleaning, taking care of my home and garden and re-energizing! Spring Break started yesterday! We have March 12-16 off. Our Spring Break begins on Good Friday, March 30th and ends April 8th! Hope you have a great Spring Break! Our spring break is Mar. 26 thru Mar. 30! We have no Spring Break. We have Good Friday and Easter Monday off. Our spring break is the week before Easter, but we will have to give back three days. We used over the allotted snow days the calendar permitted. Last week of March and we are all ready!!! ???? Our spring break is this week! I’m so excited! Our Spring break is the week after Easter! We don’t have a March Spring break but we have a week off in mid-April. Counting the days until the nice weather arrives and we can get outside! It was supposed to be the last week in March. However, due to too many snow days, we don’t have a Spring Break now. We just have Thursday and Goid Friday off. Last week of March! 10 school days to go…but who’s counting!! Ours is the 29th and 30th of March. We lost the 28th due to snow. We only get Good Friday???? We are just beginning our spring break! Looking forward to the week ahead! The Friday before Easter and that whole week after! Can’t wait!! The Friday before Easter and that whole week after. We are going camping. March 30th to April 6th!! Spring break is March 12-16th. Spring break is the first week of April. Spring break is March 24-31. I’m taking my kids to Disneyland!! Right after Saint Patrick’s day. March 18-25. This year it is the first week of April. Our first day off is Good Friday and we return the Tuesday after Easter. The week of April 16th! We get a long weekend for Easter and go back on Tuesday, April 3rd. We take the Wed-Monday of Easter weekend for our Spring break. Spring Break is in two weeks (3/26-3/30), not that I’m counting down the days, or anything. ???? We start on Good Friday! We have only a half day on Thursday (before Eatser) and the Friday before off. We lost Wednesday and Monday to snow days. The last week in March. ??? ?